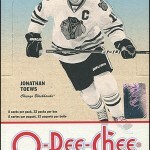 Eight years ago, during the 2006-07 season, Upper Deck “leased” the rights from Topps to make O-Pee-Chee brand hockey cards. Wow, has it really been eight years? Where does the time go? The base cards are mostly of current players, with retired greats thrown into the mix. I did not get any doubles in my box. Not all of the cards use orange and green for the borders, either. Other color combinations are used to frame each crisp, full-color photo. The backs of the cards feature complete player statistics. But really, what’s with the brown backs? Were these printed on grocery bags? Marquee Rookies are seeded one in every two packs (1:2). Since the product was released before the start of the season, it misses out on the “Double Rookie Class,” and thus features only RCs of players who debuted in the lockout-shortened 2012-13 season. The good news is, we get 100 rookie cards to collect instead of “Marquee Legends,” like we have in years past. Every pack contained a Retro Parallel, except for one pack that had a Retro Parallel and a blank-back Retro Parallel — a parallel of a parallel, if you will. This year’s Retro design is a bit bright and busy. 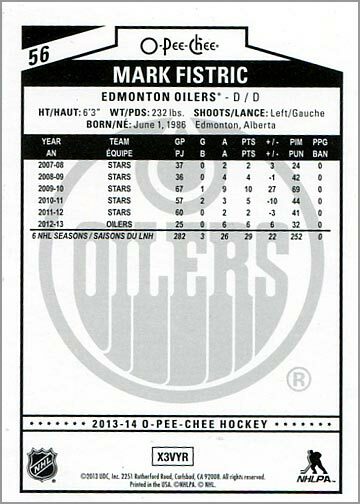 Many of them feature yellow lettering (like the Gretzky card above), which makes the names somewhat hard to read. I wish these were a bit less psychedelic and a bit more ’71-72. The design of the stickers is so nice that I wish Upper Deck used it for a full set. I am fond of these insert stickers because Topps used to insert hard-back All-Star stickers in their packs of hockey cards from 1985-86 to 1989-90. I usually shy away from the shiny parallel inserts. But I will say that these do look nice…for shiny parallel inserts. Oh, and the card backs? Way easier to read than the standard card backs. 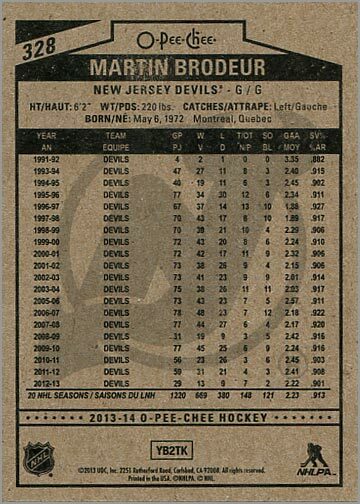 I say it every year: I wish all O-Pee-Chee hockey cards were printed on this stock, and not the usual brown stuff. The Rainbow Black parallels are serial-numbered to 100. 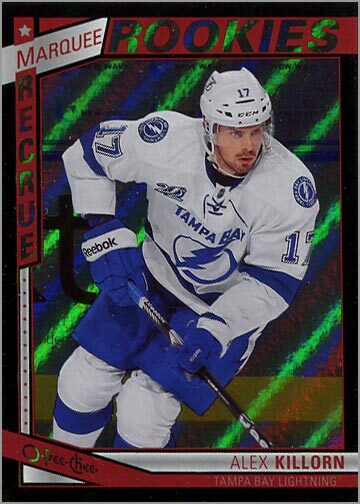 This Marquee Rookies card of Alex Killorn is numbered 99 / 100. 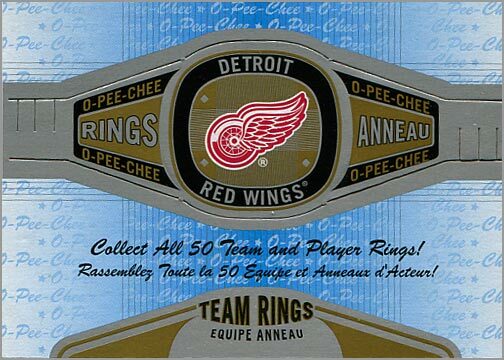 Based on O-Pee-Chee inserts from the 1970s, these “Team Rings” are new to modern OPC cards. The cards are perforated and will actually come apart quite easily if you are not careful. Quick — throw ’em in penny sleeves to keep ’em mint. And whatever you do, don’t let your kids wear them! 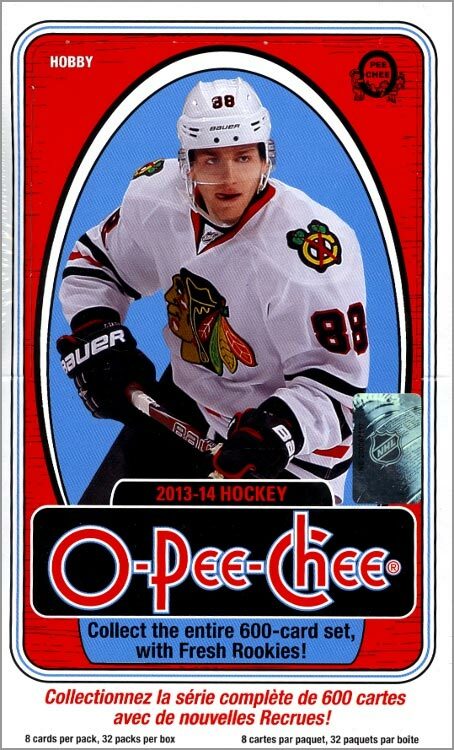 What I like about 2013-14 O-Pee-Chee Hockey: The base card design is worthy of the O-Pee-Chee name. The O-Pee-Chee logo is not overbearing like it was in the sets from 2006-07 to 2011-12. The 500-card base set features a diverse range of players, and not just the top 100 players like many of the small sets. Stickers, Team Rings and Retro Parallels give you plenty of variety to chase after. More rookie cards to collect than other sets. 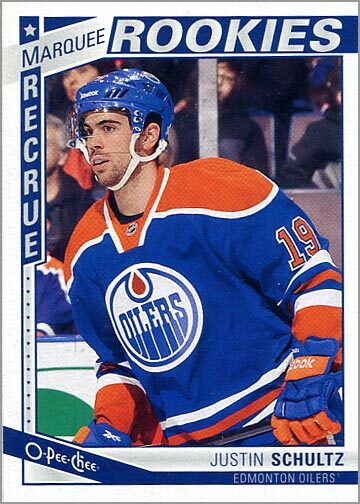 What I dislike about 2013-14 O-Pee-Chee Hockey: One RC in every two packs means that you’d have to buy 200 packs of OPC to hope to complete a set. 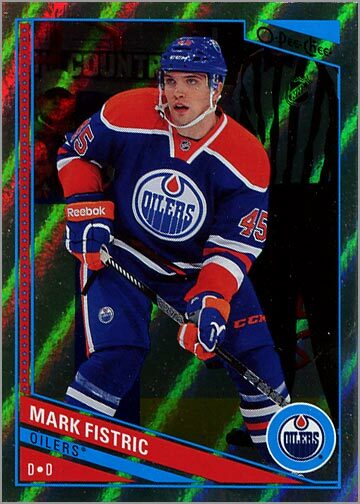 The Retro Parallel set is a bit of a letdown when compared to the Retro Parallel sets from 2011-12 and 2012-13. But my biggest gripe is the same one that I have every year: the cards are printed on ugly brown card stock. This — along with the tiny text — makes the backs of the cards nearly impossible to read. 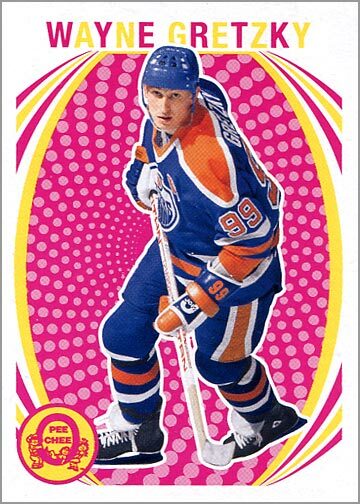 O-Pee-Chee may not be a better hockey card than Upper Deck Series One and Two, but it might be more fun because of its bright colors, variety of inserts and nostalgic appeal. 100 different rookie cards — instead of the usual 50 or so — give you more incentive to build this year’s set. Plus, the minimal amount of gloss on the fronts of each card makes them ideal for getting autographed. 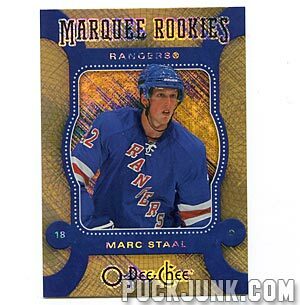 Currently, DA Card World and Steel City Collectibles are selling full boxes of 2013-14 O-Pee-Chee Hockey online. FYI, neither of those stores sponsor this site, but both are reputable dealers that I’ve purchased cards from in the past and highly recommend. Just wondering, when you do a break do you keep the cards you get or is it solely to promote the company? That’s a fair question. Sometimes I keep the cards and sometimes I give them away. Sal – great review on this year’s OPC set. I agree with you on the brown card stock and how this makes the font on the back difficult to read. I understand the effect UD tried to achieve with the brown – memories of the card stock of 70’s or 80’s cards. But they should have learned their lesson from last year and the tiny font and brown colouring just doesn’t work together. The retro set I’m not a big fan of – just toooooo gaudy. It’s the direct opposite of last year which was toooooo white. The retro cards I have I plan on using to trade for my retro needs from the prior years. I’ll pass on putting this year’s retro set together. The one thing that you did not point out is that this year’s OPC was released prior to the hockey season starting. Therefore, in spite of having 100 rookie cards, they missed a number of players who played their first NHL game this year. The result is that many of the 100 rookies are players who really are minor leaguers who managed to get into 1 or 2 games last year. It would have been better to have the set released after the season started to be able to include a stronger roster of rookies and to have players who changed teams during the off-season in their new uniforms. I would have preferred that UD strengthen the player selection in the set. In my opinion the base set outshines the insert sets. There was a significant improvement in the base set appearance last year and it continues this year. It will be nice looking set to complete. In some respect, it does remind me of the sets from the 80’s. Thank you for your very thorough thoughts on this year’s OPC set. 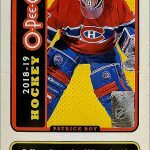 I love hearing what other hockey card lovers think. I actually did state that these OPC cards came out before the season — right under the picture of the Justin Schultz Marquee Rookies card. I also mentioned that this year’s OPC set misses out on the Double Rookie Class, since it came out before the start of the 2013-14 season. However, that is probably something I should have mentioned higher up in the introductory paragraph. True, many of the RCs are of scrubs, but I’d rather have scrub RCs than more legends cards. Besides, sometimes players need time to develop into NHL players. I’d rather have 100 short-printed RCs than 50 short-printed RCs and 50 short-printed legends. The base set is lovely. I’m debating if I am going to build this set, or buy one outright. But I do need to own a set. The retro set is ugly. Too gaudy and too much yellow. Loved the last two season’s retro sets, though. Sorry about overlooking your comments about OPC missing out on the double rookie class. I read your comments a couple of weeks ago and quickly went through them again before sitting down to write my comments and I must have overlooked it the second time. I’ve been collecting OPC since the 70’s (yea I’m dating myself) and I don’t recall ‘back in the good old days’ the OPC hockey cards coming out prior to the season starting. There was something special about collecting the set during the hockey season. Your comments about the Legends cards is something that I had forgotten to mention. I’m not a fan of the OPC set year after year having a signficant number of Legends cards in the set. Especially considering it’s almost the same players every year. I’d rather have either the current players that were missed in the set or a few more rookie cards rather than Legends cards. Or do something that was done in past OPC sets if the modern sets are paying homage to the older OPC sets – i.e. team cards, team leaders, coaches cards, league leaders, season highlights. Happy New Year and keep up the good work. I’ll keep reading your writings. I really like your review. 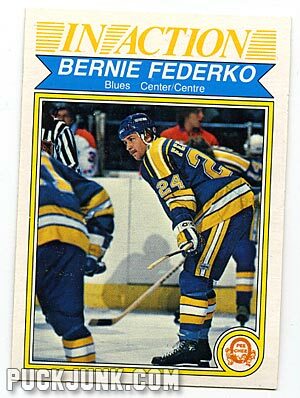 Note that I grew up in the 70s and the first OPC set I collected was the 1978-79 Bossy rookie year. This means my prime collecting years were the Gretzky, Messier, Coffee years. I recently, bought the 1971-72 Dryden/Lafleur rookie set – arguably the best ever OPC. I also think the Great One’s rookie season with the skate on the back – which helps mitigate the generic cardboard stock – is the benchmark. With Hull, Gretzky, and Howe all active. All this to say, all your readers need to know is after years and years of hiatus from OPC, the 2013-14 set brought me back into the fold. That design is classic, classic, classic 1980 OPC. As for the gaudy rookie parallels, you know, don’t be too critical. On the face of it, they are obviously too much. On the other hand, they are so playful and colourful that it’s like Soultrain might sue them for copyright infringement. …It just works. And I think this year will retain value. I mean, I am disheartened by the Toews/Kane/Price year by comparison. And keep in mind that OPC circa 1935-36 etc. equally had cray-cray colour and design, albeit art deco. Those are beautiful cards. Or, compare with the 1965-66 OPC set, which is boring by comparison. At the end of the day, the reason to collect OPC is in fact the schlock factor. They are affordable, the designs could have been done by the kids themselves, you get even the players in the press box, and it reminds “collectors” the reason we collect. It’s not because of the sugar high of “hits” and “memorabilia”. That’s just the card companies ripping people off. (How is it that an auto memorabilia card is worth more than a raw hand-signed base card? That’s just sad.) It’s not because we can flip them for a profit, after having paid an arm and a lung. It’s because we like hockey. Because we want to know everyone on every team. It reminds us that base is not waste. …Base is the entire point. Just like the third not the first line is the most important one come playoff time. I mean, Young Guns aside, can you even tell the difference between UD design from one year to the next? …I can tell you every OPC year at quick glance. And this year is classic stuff. Thank you for your comment. I like what you said: “base is not waste.” You are so right. 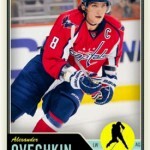 Upper Deck has finally hit its stride with the OPC sets. 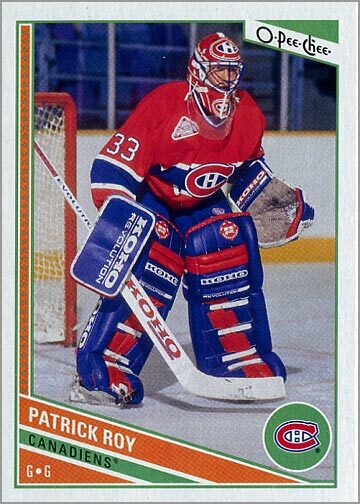 As for your question/criticism of Upper Deck Series One and Two…it is true that those sets are not nearly as iconic as OPC. Then again, Upper Deck S1 & S2 use full-bleed photography. 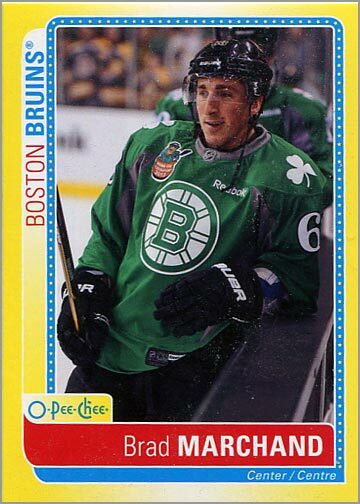 Most OPC sets are memorable by the border colors or distinct design elements (puffy letters, placement of logos, a hockey stick across the bottom, along the side, etc.). Still, OPC wins out for player selection, while UD uses better photography. The UD photos are stellar. (Certainly has improved since the 90s Pavel Bure in rollerblades or Iginla at the pingpong table!) And, collecting a few key Young Guns is an absolute must as they have settled in as the official Rookie Cards across all sets. But if you want to enjoy the process of collecting cards, whether you buy the entire sets, the hobby boxes or old school single packs, OPC is back. It cuts through all the noise out there. And, it is a perfect pastime for the average 11-year-old kid (not the ones whose parents somehow can magically afford dropping $400 on ITG Superlative/The Cup or whatever, for like seven cards total, because the stock market has gone roof-daddy for the few.) This said, I did cave and buy the 2007-08 OPC set very affordably, even with the bad design. It grows on you a bit. And I just feel like foregoing the Toews/Kane/Price year is like missing out on the Messier/Bourque/GretzkyYr2 set. 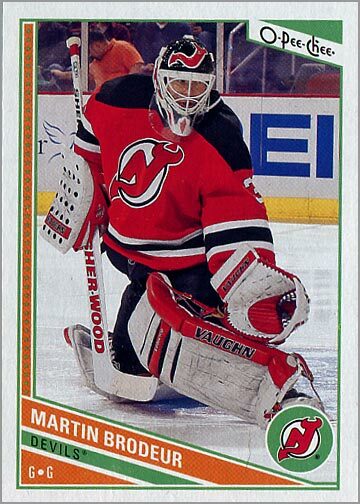 Plus buying UD Series 1&2 would cost $500 (Does it come with a full pair of goalie pads??). Mindful that the market is now saturated – so it’s more about possession and sentimentality with OPC than value. Again, cheers on a nice thread here. You know your stuff.